Byran, it was a great evening at Victory last night! I am glad you, Adam and many others were able to be there and cheer on our Fightin' Phils. 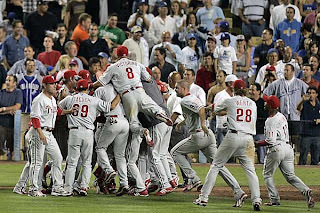 Looking forward to watching them keep on rolling and winning during the World Series (God, it's great to say and see the Phillies in the World Series). Just pray that your Phils don't get swept in the World Series like my Rockies did last year. Still haven't gotten over that yet. Nice to see Santa made an appearance. OH I’m sorry that is Mr. Steve Ryan!!!! I am happy you folks had a great time and for the Phillies too. Richard , Thanks for the heads up invite last night. I forgot how much fun it is to watch a game with your bud's at a Pub. What a Blast! The Phil's are Rockin, So we'll have none of that bad karma speak from "Chipper Dave". So Rich if I'm Santa You Must be the Leaping Gnome!